my previous post was the front of my island girl doll. this is the back. 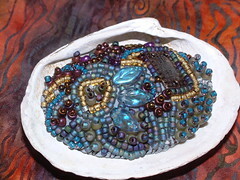 she features shells, seed beads, vintage and contemporary pressed glass beads, alphabet beads, a vintage glass scarab, and coral. click on the thumbnail to see larger! One of Camilla's dolls reminded me of my own Island Girl doll. This doll is about 10" long. 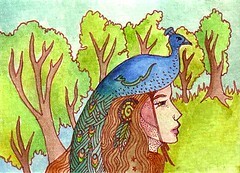 She was inspired by my childhood on Vashon Island. 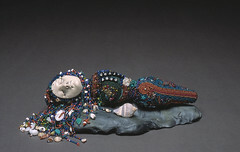 The face was created by Diane Bregleb. 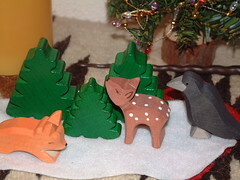 i love my little wooden animals. this is a little scene on my bedside table. my tree is awesome. and i have not even put any ornaments i made on yet. well, for this year. but i may end up making some ornaments for me AFTER christmas. anyway i love my copper tree and all the earthy colors. + i decorated it with some of my little toys! bree molinar made the bird on top, and someone, i think andy stern or emmy? made the mouse in the nest. 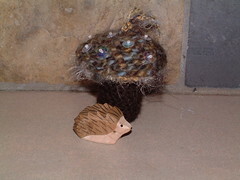 i am not sure who made the hedgehog, but he is needle felted. the tiny tiny birds have magnets in them and they cling to the wire that is the core of the tree. i used lots of little "picks" from jo-anne's. the tree skirt is batik my sister brought back from.. mm, turkey, maybe? i am not sure. 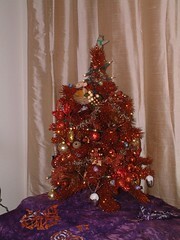 it's really beautiful and the orange and purple set off the tree well. this is what i have been working on lately.. a commission. someone saw my little red riding hood and wanted one in blues. so here we have it! it's not done yet, though. 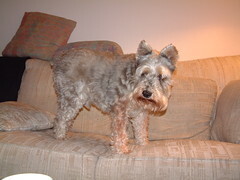 i will be off soon to have thanksgiving dinner with my mother, stepfather, and good old taser, the schnauzer. Pendleton Mills (I need to press it!) I believe it is called Spirit Quest -- it is a pretty recent design. 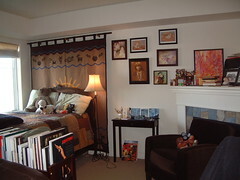 You can see a number of prints on the walls -- Naomi Novak, Audrey Kawasaki.. three originals by Anna Barrow are on the little table. 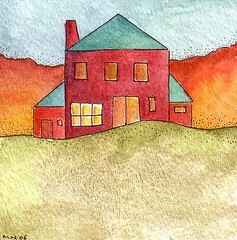 The Watercolor on the mantle and the pen and inks were by me. The Native American Girl is a Curtis Print -- not a very good one. I would love to own that photogravure some day. It's my favorite of all his photos and is called Mosa Mohave. (Mohave Girl). this was so much fun to bead. i made it for an on-line friend, but now i want to make more and i have some other ideas that were inspired by this! as you probably know, i grew up on and island. and i am so glad i live in the pacific northwest, where the beach is never that far away. this shell was one from my little hoard. i am pretty sure it came from a place called hoko, on the strait of juan de fuca. with tiny wooden hedgehog. that little fluff at the top is the hanger..
the mushroom is crocheted and the spots are transparent iridescent sequins with beads. i went to the doctor this morning. it went really well. it was good to finally get all the info, because i was going on photos and what audin remembered, but i had a lot of questions. when they did the laproscopy they found that my uterus and ovaries were wrapped in scar tissue (adhesions) that extended back to fill the area behind my uterus and underneath. 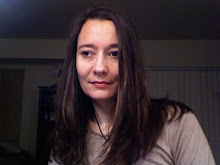 the adhesions connected to the wall of the pelvis below and behind, prevented my ovaries from moving freely, and connected to my large intestines. they removed all of that. it might come back but we don't know. we don't know what caused it - some sort of inflammatory reaction. it could have been ruptured cysts. i had a 6cm one 3.5 years ago and have had several others. or it could have been something else, maybe related to my IBS. when i would sleep in a strange position or stetch or something it would pull my organs into strange positions because the scar tissue is not very flexible. if it does come back i feel like i can deal with it. i like my doctor and i trust him to do surgery again. i know how much time to take off work. i guess i will just take things as they come and try to have the least amount of pain and best quality of life that i can. i hope that when i am the rest of the way healed i will have less ibs problems. i am recovering well, my incision is healing well, and if i don't have any problems i will not have to go back to that doctor for a year. i listed some of my little critters on etsy if you are interested. they are even cuter in person. 2 days back at work full time. i am tired but maybe not any more tired than usual, not sure. back for a check up at the dr. tomorrow. what a nice evening. since i was not in any physical condition to celebrate my birthday on the day, three of my friends took me out to dinner this evening. we went to one of my favorite restaurants. the food was good, the company was good, the cosmopolitan was good.. then i had gluten-free cake, especially made for me, and got to play with kitties. a very nice evening. i am thankful i have good friends. this is a little painting i did last year..
yesterday was a bad pain day, but fortunately i got some chores done before it hit. and i sat on the sofa and crafted later. hopefully today will be better pain-wise. i had to stop taking painkillers because of my poor sensitive tummy. 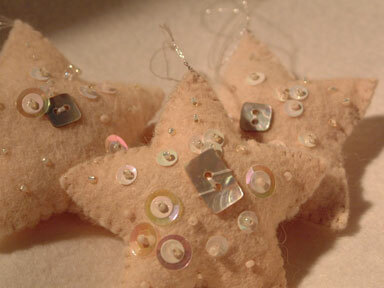 i decided to write up a tutorial for these star ornaments i made recently. 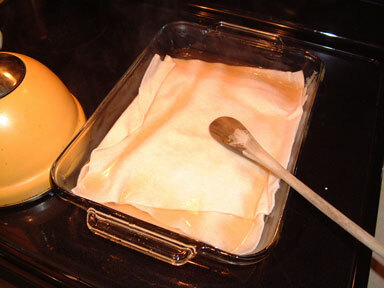 step 1) you will need a handful of black tea bags, WOOL or WOOL / RAYON felt, a glass dish, and boiling water. Make sure you are not using acrylic felt. cut your felt into pieces that will fit in your dish. 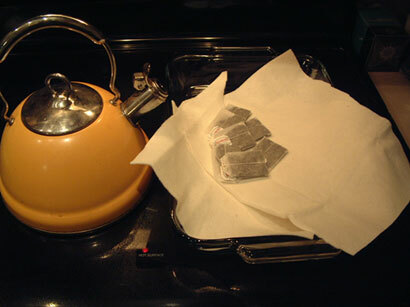 step 2) place the tea bags in the glass dish and pour the hot water over them. 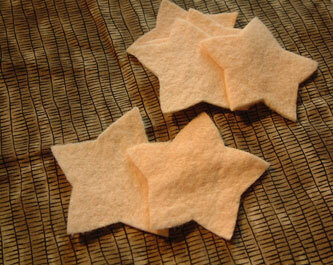 let them seep for a few minutes and add your wool felt, one piece at a time, making sure the wool is saturated. i used a wooden spoon to assist. let your wool felt rest in the tea for at least a half and hour. 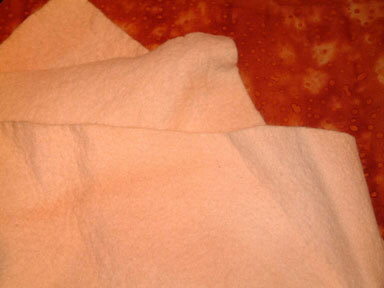 if you allow the felt to fall into folds then the color will vary a bit, which i like. step 3) remove the wool felt from the tea bath, squeeze out excess fluid, and toss in a hot dryer for about a half hour or until dry. 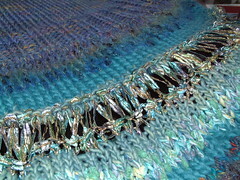 this will cause the felt to shrink a bit and fluff up, creating a pleasing organic texture. step 4) when your felt is dry, cut simple shapes from it. you can use christmas clip art, or trace around cookie cutters if you do not feel making a pattern freehand. i drew my pattern on paper, cut out, and taped to the felt then cut out. cut 2 pieces for each ornament. 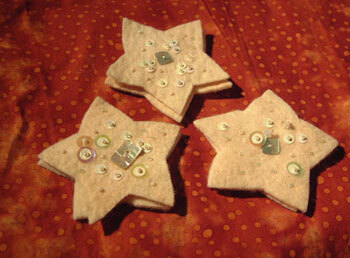 step 5) using strong thread, stitch beads and sequins to your felt. you can see in some places i staked a larger sequin under a smaller sequin, then went through a bead, then back down through the 2 sequins. i also used some mother - of - pearl buttons. for thread i suggest beading thread, selected to match your felt. 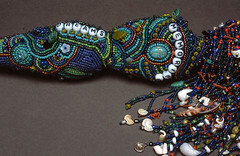 if you do not have beading thread you could use 1 strand of embroidery floss, which is also strong. 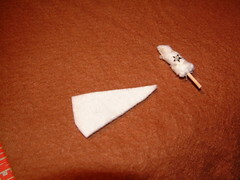 step 7) lastly, place your back and front pieces wrong side together and stitch shut using blanket stitch or whipstitch. before you go all the way around, stuff the star with a bit of stuffing. add a hanger (i like to use metallic floss,) and your ornament is done! the background in this photo is undyed felt. you can see the dyed felt has a light antique look. if you want yours to be darker, use more teabags. enjoy! i would love to see what YOU make! for those keeping track, i went back to work for a half day yesterday and most of the day today. i must say, being a productive member of society is quite draining and i would rather be a cat. 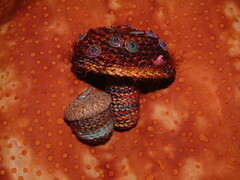 i have crocheted a few mushrooms lately. 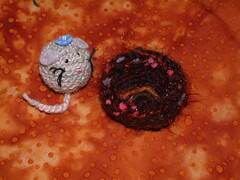 also this is a new acorn, from the pattern here. click this photo to see more mushrooms on flickr! if you read my previous post, i did not feel right posting a picture of my parents without the 3rd member of their little family. taser also wishes you happy anniversary and he also hopes you are having steak for dinner. hi, taser. 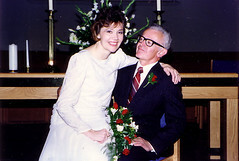 happy 19th wedding anniversary to my wonderful mother and stepfather. sorry i did not get my atc together and send a card! i hope you are having steak for dinner tonight! happy birthday to my twin sister marti, and thanks to mom for raising us both. 38 years ago today my mother worked her last day before maternity leave, troubled by a backache. she went to the hospital for a checkup, sure it was false labor because her due date was mid december. by dessert she had twins, and i am sure she did not quite know what to do with us at the time. fortunately we were in isolettes for 16 days and she had time to rally. thanks, mom. happy birthday marti! thanks for the box of treasures! 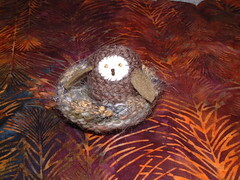 i like the nest, i made 5 of them last week, but i think i am still working on the owl. 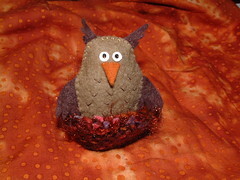 i might like a knit or crocheted owl better. what do you think? he is made of wool felt, which i distressed by getting it damp and tossing in a hot dryer for 30 minutes. this causes it to fluff a bit and the texture is more organic. always dry light colors together and dark colors together to prevent colors bleeding on each other. sometime in the next week or so i will have a tutorial for you on making holiday felt ornaments wherein i show you how to tea dye felt. i will finish putting that tutorial together when i feel better. in the meantime you can look back to Oct 30 to see my tutorial on making a wool felt unicorn with jointed limbs. 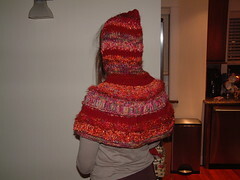 i need to do more freeform knitting next year. i followed a lot of patterns this year. that's fun too, but in a different way. my favorite free-form knitter is jane thornley. 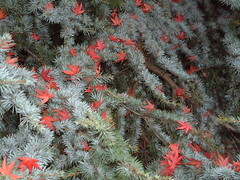 see her recent blog posts about knitting in italy and my favorite - autumn inspired knitting. this vest is my version of the painter's vest. i am very happy with how it turned out but would also like to do a longer one. 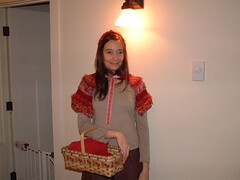 the little red riding hood cape (see my post Nov 1) that i knit for halloween was thornley inspired - but i created the pattern as i went - which i guess is thornleyesque too. 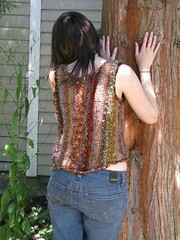 if you are on ravelry, check out the jane thornley group, in which jane herself is active. audin malmin took this photo last summer. click the photo to go to flickr and see a photo of the front. i made this last weekend. mouse in her nest. i might make more to sell on etsy -- or if you are interested in one maybe just let me know. i was thinking around $15. isn't she cute? they are tiny, the mouse is about the size of a walnut. i must be getting better because i am feeling well enough to be aware of how bad i feel. spent some time on the sofa today, that was progress. took a shower. did not manage to get the mail, which i did yesterday. fever is up a bit, though not to the point the discharge paperwork said to worry about, so i will just watch it. the bleeding is worse too, but again not to the point the paperwork said to worry. i am going to take my pills and go to sleep. it's hard for me to imagine that some people just bounce right back from this in a day or 2.
last night i had a hard time sleeping because of the pain. i took the painkillers and ibuprofen every 4 hours. i have continued that today. they render me unable to concentrate and mostly useless. i have not been able to read. i have slept a lot. i feel like i did 1 million sit-ups. i think i will go to bed soon. i am about to eat some soup. the surgery center called to check on me. it sounds like everything is normal for this point. i am hoping i can sleep better tonight. for longer at a stretch at least. brent brought me some rice pudding this morning, that was good. o am home. my friend who went with me, audin went to get me some soup and apple sauce. they removed a lot of adhesions that were wrapped all around the outside of my uterus, to the point where my ovaries could not even be seen. from the photos it looks like some may have interfered with my intestines too. i am very tired so more later. i was sent home with painkillers and anti-inflammatory drugs which i will be taking. i am glad audin went with me and my friend janusz came over and did chores while i was gone so i came home to clean bathroom and kitchen. vacuumed rugs and new sheets on the bed. i am lucky to have good friends. everyone at the hospital was nice too. i saw this near the ferry dock on bainbridge and it was so beautiful that i had to take a picture. i love japanese maples, anyway. i am going to lie low and get some rest this week, then i am having a laparoscopy on thurdsday, a procedure that is probably long overdue. i hope i don't take too long to bounce back -- i am told 2 days -- 2 weeks depending on the person and what they end up finding. so if i am quiet for a bit, you know why. on the other hand i might blog to distract myself from fetting, one never knows. happy november, in any case. little red riding hood from the back. i made up the cape pattern as i went. little red riding hood from the front.